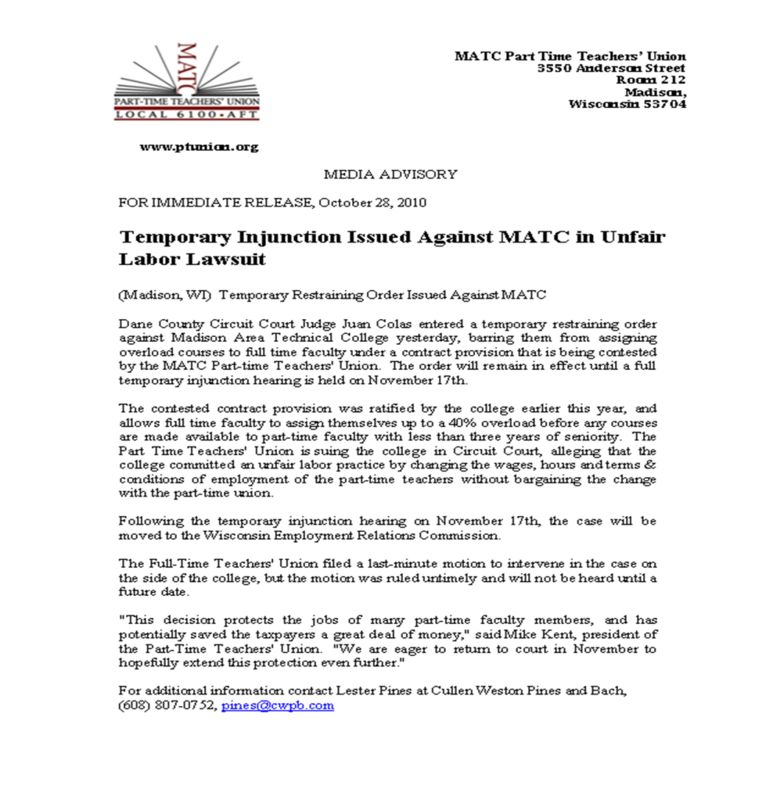 ﻿The following letter was issued late last week by the P/t Union regarding our ongoing legal struggle with the MATC administration. Click the image to enlarge. Our good friend Deke Rivers over at Caffeinated Politics got the scoop on the Wisconsin Legislative Audit Bureau's plans to Audit MATC. The Wisconsin Legislative Audit Bureau decided on Wednesday that there will be an audit of the technical school system in the state. CP is waiting for the exact language outlining the scope of the audit. It was reported to me that MATC President Bettsey Barhorst was at the audit meeting on Wednesday and voiced strong opposition to any audit. Democratic Representative Marlin Schneider again stood up for the citizens and called out the reason such an audit was essential to be undertaken. If the head of MATC shows up with such energy to oppose an audit, there then seems even more reason to have one. The Part-time Teacher's Union wonders what Mrs. Barhorst has to hide? Our hope is that this much overdue audit will shed some light on the real workings of a, thus far, very secretive organization. 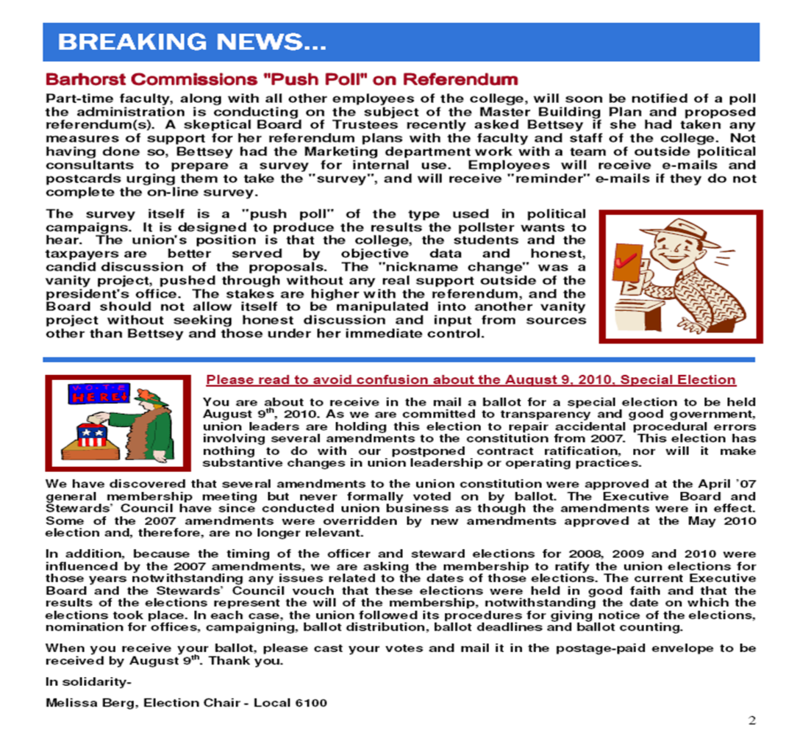 Earlier this week, you likely received a letter from Bettsey Barhorst, encouraging you to contact the union leadership and encourage us to schedule a vote on ratification. The letter contains several factual inaccuracies, which we felt we should bring to your attention. First, let’s concisely reiterate the reason we are delaying ratification. In April, the college entered into an agreement with the Full Time Union that allows full time faculty to bump probationary part-time faculty out of courses and to claim those courses as overload. Rather than openly and honestly informing us of this proposal while we were bargaining, the management concealed this information from us, and we were only able to discover the proposal when the full time union posted it on their website as part of their ratification packet. It is ironic that Ms. Barhorst now speaks of the obligations inherent in good faith bargaining. As I indicated in the letter we sent on July 2, 2010, we attempted to prevent the ratification of this toxic provision through numerous means. These efforts were taking place parallel to our own bargaining process. At no time did we concede to this new course assignment language in bargaining. It never even came to the table. After the Board ratified the Full Time contract in April, we brought in outside legal counsel. We have never claimed that we were unaware of the provision. It has always been our contention that the full timer language constituted an unfair labor practice. It has always been our intention to contest it. 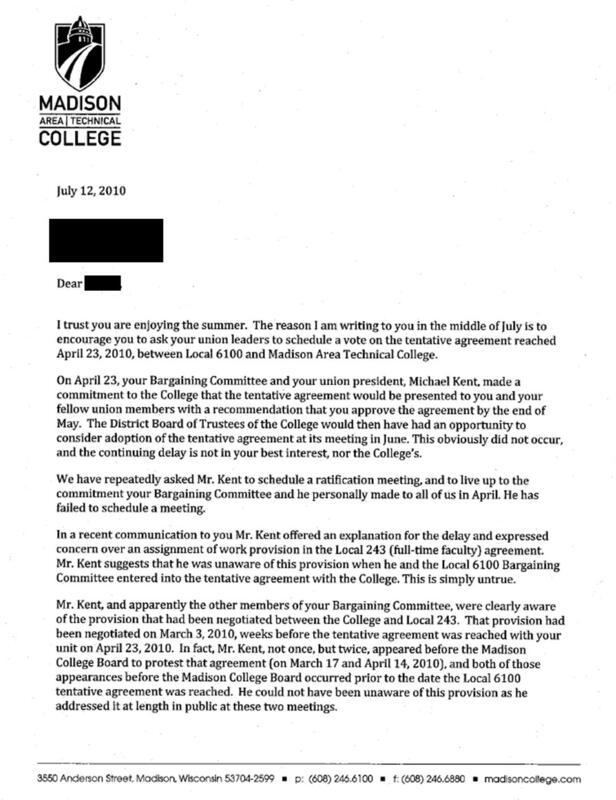 I personally told the MATC Board of Trustees on both March 17th and April 14th that our union viewed that agreement as an unfair labor practice. After reaching our various tentative agreements (TAs) with management, we again met with our outside legal counsel, Lester Pines, about the unfair labor practice claim. After researching the law, we concluded that ratifying the rest of the tentative agreements would be damaging to our unfair labor practice complaint. The bottom line is that, as long as we have not ratified the TAs, management cannot claim that we have waived bargaining over the course assignment issue. If we have not ratified the TAs, we will probably win our unfair labor practice case. If we do ratify the TAs, we run the risk of losing the unfair labor practice case. Not surprisingly, the management REALLY wants us to ratify the TAs. Also not surprisingly, they have refused to address the full time overload issue with us. Their offer to discuss the issue only after ratification is disingenuous. After ratification, we have little recourse if the college simply refuses to move on the issue. 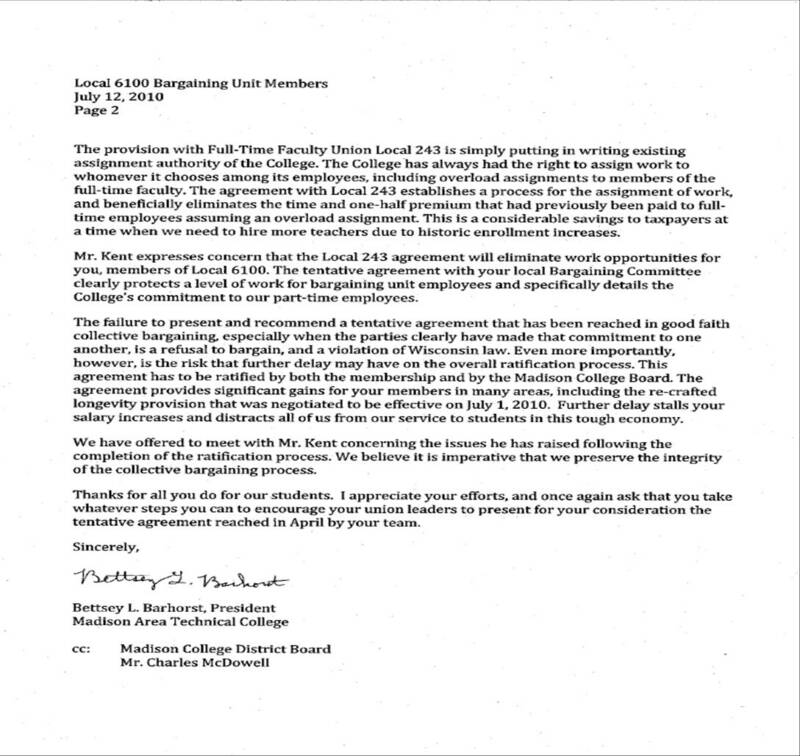 As to the second page of Ms. Barhorst’s letter, I believe the best response is to simply share the rest of the information that she neglected to mention. In the first paragraph, it is true that the college has always had assignment authority. The new agreement takes the authority to assign overload away from the Center Deans and grants it directly to the full time faculty. Voluntary overload has historically been compensated at rates ranging from the part-time course rate, to the regular full-time rate, and in very rare circumstances at 150% of the full time rate. Involuntary overload is paid at 150%, and is unaffected by the contested Memorandum of Understanding The agreement ended the practice in some centers of paying FT faculty at the part time rate for voluntary overload, and gave full time faculty control over the amount of overload they take. There is no way this agreement could be characterized as a “cost savings.” The attempt to characterize an agreement that takes courses away from part-time faculty at $2500/course and gives them to full-time faculty at $6000-7000/course as a “considerable saving to the taxpayers” simply does not comport with reality. In her second paragraph, Ms. Barhorst seems to suggest that the union’s concern that the FT language will result in part-time faculty losing work is inaccurate. 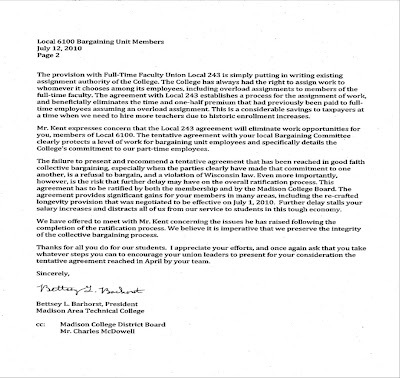 She suggests that this is because of a tentative agreement the college proposed which “clearly protects a level of work for bargaining unit employees.” The tentative agreement Ms. Barhorst references states that the college will establish a “target” of no less than 25% of the courses at the college being taught by part-time faculty. Currently, part-time faculty teach about 50% of the courses at the college. In addition, there is no clear recourse if the college falls below the “target.” The TA in question offers no protection against substantial job losses by PT faculty. In her third paragraph, Ms. Barhorst suggests that a refusal to present the TAs for ratification is a “refusal to bargain.” An interesting position, coming from a management team that is refusing to negotiate over the course assignment language they attempted to unilaterally impose on the bargaining unit. Quite contrary to Ms. Barhorst’s assertion, the union is quite ready to bargain this issue with the administration and it is the administration that is refusing. In addition, I think most of you are sophisticated enough to know that “stalled salary increases” mean little when you aren’t working. Furthermore, I think most of you understand the concept of “back pay” in the event the contract was not settled before the fall semester. In closing, in this letter Bettsey condescendingly suggests to you that she is a better judge and advocate of your interests than your union bargaining team. That she thinks you might actually buy that line tells you everything you need to know about her opinion of part-time faculty. *We occasionally like to use sarcasm on this blog. This would be one such occasion. Mrs. Barhorst - you cannot frighten us. We stand strong. At this point, you have received two communications from the union delaying the ratification vote on the tentative agreements between the college and the union. You are probably wondering why. The purpose of this letter is to explain the problem we have encountered and to inform you about the options the union is pursuing to overcome this latest challenge. To understand the issue, you need a little history of our talks with management over the past 6 months. You will recall that last fall we informed you we had reached an impasse with the management’s bargaining team on several key issues: job security, course scheduling and wages. We initiated mediation with the college, and were able to come to some agreements in a number of key areas. Job security and course assignments were a major source of disagreement, but we managed to settle on mutually agreeable language in December. By the end of December, the only negotiations that were taking place between the parties were the exchange of proposed final offers, dealing solely with the issue of wages. From January through April, we exchanged a number of proposals back and forth with management until we finally agreed on the wage proposal that was presented to you at the end of April. What we didn’t know at the time we were negotiating, but later discovered, is that in February and March, 2010, management was negotiating new contract language with the full-time union that would change the way courses were assigned within the centers. The system that had existed previously gave full-time faculty first claim to all courses up to their normal full-time load. The classes that remained after the full-timers had their full load were then assigned to part-time faculty, and in some cases given to full-time faculty as “overload.” The Deans and Associate Deans of the centers were responsible to decide how the courses were distributed and could take into account such things as their budget, the past assignments given to full- and part-time faculty members, the expertise of the full- and part-time faculty members, student feedback, etc. Under this system, the managers were responsible for making decisions that were in the best interest of the students, the college and the taxpayers. 1.) Full-time faculty receive their normal course load. 2.) Non-probationary part-time faculty receive their base assignments. 3.) All remaining courses are then offered to full-time faculty to take as overload, up to an additional 40% load (2-3 additional courses). Full-time faculty are not limited to their own departments, but may take any courses for which they could potentially obtain temporary certification, regardless of whether they have ever taught the course before. 4.) Probationary part-time faculty receive whatever is left. This was obviously a profound change in the course assignment process. Probationary part-time faculty comprise two-thirds of our membership, and this new scheduling process put them all at substantial risk of losing their courses. (Probationary faculty are those who have taught for the college for fewer than 6 semesters.) The college essentially gave the full-time faculty the right to assign themselves overtime. There are a number of shocking aspects to this proposal. The insane misappropriation of tax payer resources, the impact on students, and the philosophical position that it is more important for the well-compensated full-time faculty to receive overload than it is for our grossly-underpaid regular members to receive even their basic course assignments. The union took the following action in response to this proposal. We contacted the Full-time Faculty Union, AFT-WI and ultimately brought our concerns to AFT-National. I addressed the MATC Board twice, drawing their attention to the implications of this proposal. We asked the full-time faculty not to ratify this provision that was so harmful to our members. Ultimately, none of these efforts did any good. In the mean time, we negotiated our economic settlement with management. Management never brought the new course assignment process to the table and never even told us they were negotiating it with the full-time faculty. We only discovered it after the full-time faculty announced the agreement. After reaching our economic settlement, and after the Board ratified the full-time tentative agreements, we evaluated our options with respect to the course assignment language. Wages, hours and terms and conditions of employment are legally known as “mandatory subjects of bargaining.” An employer cannot unilaterally change the status quo in any of these areas without bargaining with the union. Clearly, management’s agreement with the full-timers has an impact on our hours and terms and conditions of employment. To implement that change without bargaining it with us is an Unfair Labor Practice, which we could attack in court. This is our option of last resort. Our dilemma is that if we ratify our contract without bargaining over this issue, management could take the position that we waived our right to bargain it, thus harming our Unfair Labor Practice claim. They could take this position, even though they never disclosed their intent to change the status quo on the course assignment process. (MOU) to deal with the course assignment process. We have attempted to deal with this demand by seeking an agreement with management that acknowledges that the ratification of the other Tentative Agreements (TA’s) would not constitute a waiver of the course assignment issue. Management has rejected these efforts. Our last proposal to management asked for a mutual understanding that by ratifying the tentative agreements we were agreeing to change the status quo in the manner described specifically in the TA’s and that we were not agreeing to modify the status quo in any manner not described in the TA’s. Management’s rejection of that language sent a strong signal that they intend to make the waiver argument. Our efforts to engage AFT-WI and AFT-National to mediate the issue with the full-timers have been unsuccessful. Our perception of these organizations is that they simply value the full-time faculty more than they value us, and the full-time faculty union has no apparent interest in discussing the issue. Worse, last fall AFT-WI made thinly veiled threats that it would attempt to impose receivership on our union if we didn’t stop upsetting the apple cart with the full-time union. We have taken measures to protect our union and the part-time faculty members against such action and will be providing more information on these matters in later communications. So, as the situation stands now, we have brought in outside legal counsel for the Unfair Labor Practice claim. We are attempting to schedule a final meeting with management, including legal counsel on both sides. If we fail to come to an agreement, we will be seeking an injunction against the implementation of the new course assignment process. 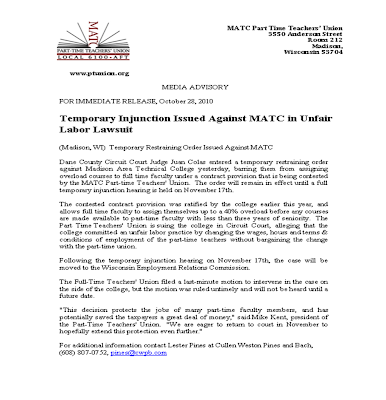 It is possible that this course of action will send us to arbitration on the contract, and it is possible that MATC will revert to an earlier final offer. The executive leadership of the union believes, nonetheless, that the course assignment issue is too important for too many of our members to surrender. 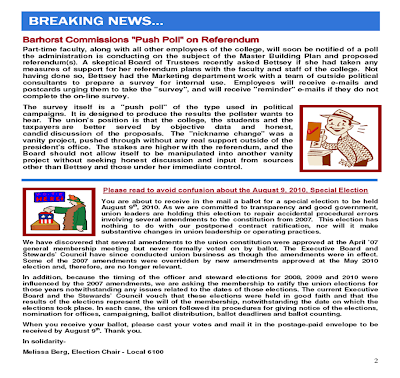 We will keep you posted on this issue, and other issues the union is facing this summer. Until then, we remain loyally, faithfully and diligently in your service. Part-time or not, the teachers should be treated fairly. Good to see them get a good deal. Thanks for the support. Full post here.